zoom it zoom out move forward ... after a few attemps the problem shows. in real condition it shows up randomly. I just noticed this too, but strangely it only affects data from one particular host so far. I am using node_exporter 0.16.0, and am graphing CPU times by mode (e.g. user, system, iowait etc). 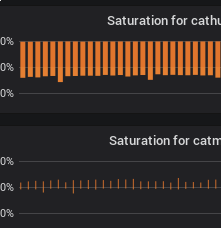 I only notice this weird effect for a host that has 64 cores, but I really doubt it's related to that. I can reproduce the issue by simply clicking on the graph refresh button once per second. The bars get thinner with each refresh, then at the next interval alignment, they are back to their regular width. Can you show the query used to replicate this? Found the culprit: the null filling is not aligned. Hence you get oddly stepped values injected. The step informs the bar widths. If the injected values are close to real values, the step is really small and the chart lib thinks there are lots of bars and sets a small width. Hi, is there any planned date of releasing this fix? I see that 5.2.2 milestone is complete. Charts using bars are kind of useless right now, so just to know if I should rollback or wait.